Our evaluation routine for hard-drive based direct-attached storage devices borrows heavily from the testing methodology for flash-based direct-attached storage devices. The testbed hardware is reused. 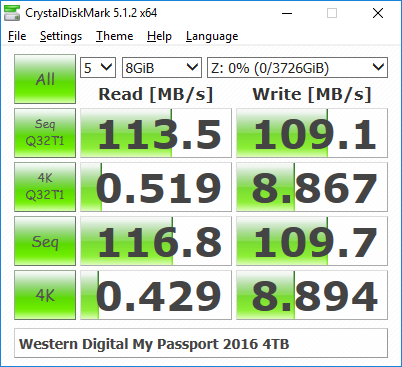 CrystalDiskMark is used for a quick performance overview. Real-world performance testing is done with our custom test suite involving robocopy bencharks and PCMark 8's storage bench. 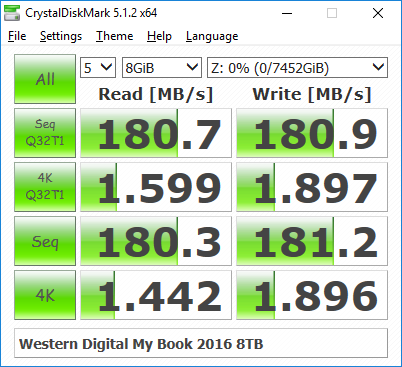 The first interesting comparison in the table below is between the My Book with the 5400 RPM HelioSeal drive and the G-Technology G-Drive with Thunderbolt over USB 3.0 that employs a 7200 RPM HelioSeal drive. While the 1 MB sequential access traces show the 7200 RPM drive in better light, the use of a bridge chip supporting UASP helps the 5400 RPM My Book pull ahead by a huge margin in the high queue-depth sequential access trace. The second interesting comparison is between the My Passport and the LaCie Porsche Design Mobile Drive. 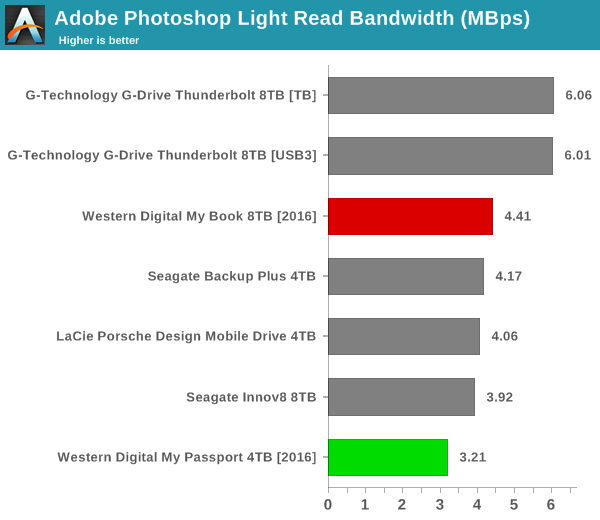 The Seagate Backup Plus, though being based on the same internal drive as the LaCie Porsche Design Mobile Drive, was evaluated with an older version of CrystalDiskMark / different testbed, and its results are only presented here for the sake of completeness. Going back to the comparison, we find that the different bridge chip configuration, as well as differences in caching and hard drive firmware, make each of the units perform better than the other under different use-case scenarios. That said, the LaCie Porsche Design Mobile Drive performs better overall for this set of artificial benchmark traces. 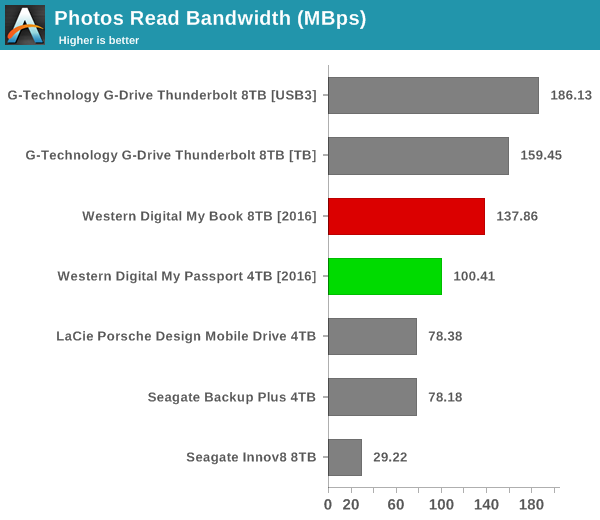 The performance numbers show that the My Passport 4TB performs better than the LaCie Porsche Design Mobile Drive 4TB for reads, while the situation is reversed for writes (which is similar to the behavior we encountered in the CrystalDiskMark traces). The G-Technology G-Drive with Thunderbolt 8TB betters the My Book 8TB consistently even over the former's non-UASP USB 3.0 interface. The Seagate Innov8 is nowhere in the picture because of the Archive HDD inside, but its use-case (bus-powered high-capacity DAS) is quite different compared to the My Book. Readers interested in looking at all the graphs in one shot can choose the 'Expand All' option in the dropdown menu. Usually, PC Mark 8 reports time to complete the trace, but the detailed log report has the read and write bandwidth figures which we present in our performance tables. Note that the bandwidth number reported in the results don't involve idle time compression. Results might appear low, but that is part of the workload characteristic. Note that the same CPU is being used for all configurations. Therefore, comparing the numbers for each trace should be possible across different DAS units. The general trend we observed in the robocopy benchmarks is seen here also. Readers interested in looking at all the graphs in one shot can choose the 'Expand All' option in the dropdown menu below.